Maximize your home workouts with Body Rider 2 in 1 Dual Trainer. 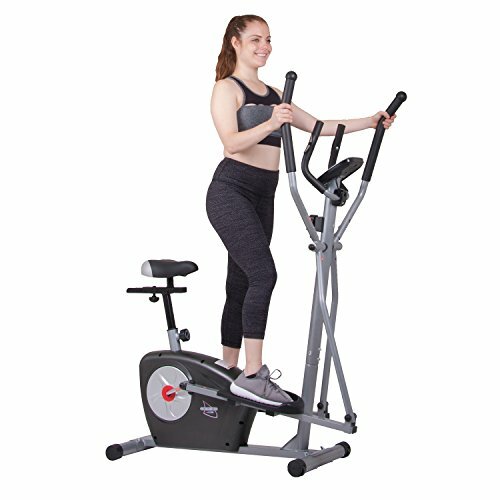 Blast away fat while building fitness and stamina with this space saving elliptical machine that transitions smoothly and easily to an exercise bike trainer for both elliptical and upright positions. With an easy to read, fully programmable console and 17 fitness programs to choose from, your full body workout routine can be tailored to maximize your fitness level and goals. Carefully designed to provide exceptional comfort and support in each position, while providing full upper and lower body engagement. 16 resistant levels to meet and push your current abilities and to grow with you. For a high intensity workout with low impact on your knees, hips and ankles, this budget-friendly home elliptical machine really delivers big results in a small space. Work both your upper and lower body with the handles moving, or lock them into a stationery position to focus on strengthening your core muscles. The natural stride length of 13 inches, both protects against muscle strain and produces an exceptional cardio workout. Really work your hamstrings, obliques and glutes by reversing the pedals and striding backwards. Your home elliptical grows with you as your fitness levels increase. Easily adjust the levels of resistance to maximize your workout. The turn of a knob adjusts the friction belt to tailor your workout to your preferences and ability.